Daren Moore's West Brom have won five out of their last six matches in the Championship. 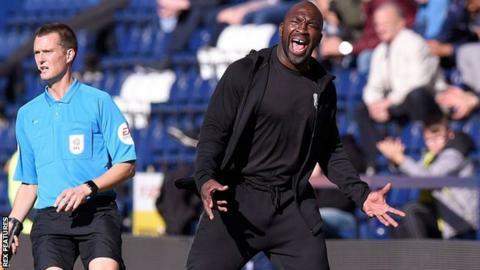 West Brom boss Darren Moore promised there was "more to come" from his side after they moved to the top of the Championship table with victory at Preston. After Ryan Ledson hit the post for North End in the first half, Rodriguez headed home Jake Livermore's cross. Preston drew level when Andrew Hughes curled home the free-kick, but a Ben Davies own goal restored Albion's lead. Gayle made it three with a free-kick of his own before Alan Browne headed Preston's second in added time. "A win in this league is always good and to pick up three points on the road. I thought we were worthy winners today." Darren Moore told BBC Radio WM after the match. "I always felt that we were in control of the game but just needed more urgency in possession of the ball to move them around a bit more. I have no complaints, the boys found the way to win the game." The victory puts West Brom one point clear of Leeds, Middlesbrough and Sheffield United, while Preston dropped to the bottom with only five points from 10 games. "We're a team in transition, we're a team trying to progress, we're a team trying to get results in a very tough division." Moore added. "I really do feel there is more to come and together, collectively as a group, a unit and a football club we have to keep working. "It's the whole group that has given us the platform to move forward and we have to keep moving forward." In the first game between the two sides for eight years, Albion made the faster start and Chris Maxwell had to be alert to push away Kyle Bartley's header. But Preston came closest in the opening 45 minutes as Alan Browne played the ball back to Ledson, who saw his effort cannon off the upright. The Baggies asserted themselves after the restart and soon went in front as Rodriguez beat marker Jordan Storey to Livermore's ball into the box and headed powerfully into the top corner. Hughes' equaliser gave North End hope of avoiding a fourth successive defeat, but Craig Dawson's cross skimmed off Davies' head keeper Maxwell could not keep it out of the net. Gayle's goal appeared to have made things safe for Albion, but Preston were not finished and Browne reduced the deficit after Louis Moult had an effort saved by Sam Johnstone. "I'd be lying if I said I wasn't concerned about the table. "We need to pick up a lot more points and pick them up quickly. Winning is a habit and losing can also be a habit. The fact is that we need to muck in together and it's frustrating for the players and the coach. "All we can do is keeping working hard, they're a good bunch and they want to put it right. We've got two really important games coming up then a break then a batch of really important games. I think the character of the players and the club is that we don't give up, we keep going." Match ends, Preston North End 2, West Bromwich Albion 3. Second Half ends, Preston North End 2, West Bromwich Albion 3. Attempt missed. Ryan Ledson (Preston North End) header from the centre of the box misses to the right. Assisted by Tom Barkhuizen with a cross. Josh Harrop went off injured after Preston North End had used all subs. Goal! Preston North End 2, West Bromwich Albion 3. Alan Browne (Preston North End) header from very close range to the centre of the goal. Attempt saved. Louis Moult (Preston North End) left footed shot from the left side of the box is saved in the centre of the goal. Assisted by Josh Harrop. Substitution, West Bromwich Albion. Sam Field replaces Dwight Gayle. Attempt saved. Ryan Ledson (Preston North End) right footed shot from outside the box is saved in the centre of the goal. Assisted by Alan Browne. Attempt missed. Jake Livermore (West Bromwich Albion) right footed shot from the right side of the box is too high. Attempt saved. Dwight Gayle (West Bromwich Albion) left footed shot from the centre of the box is saved in the centre of the goal. Assisted by Hal Robson-Kanu with a through ball. Substitution, Preston North End. Josh Harrop replaces Darnell Fisher. Goal! Preston North End 1, West Bromwich Albion 3. Dwight Gayle (West Bromwich Albion) from a free kick with a right footed shot to the top left corner. Kieran Gibbs (West Bromwich Albion) wins a free kick in the attacking half. Sam Johnstone (West Bromwich Albion) is shown the yellow card. Substitution, Preston North End. Louis Moult replaces Brandon Barker. Foul by Brandon Barker (Preston North End). Own Goal by Ben Davies, Preston North End. Preston North End 1, West Bromwich Albion 2. Substitution, West Bromwich Albion. Chris Brunt replaces Gareth Barry. Substitution, West Bromwich Albion. Hal Robson-Kanu replaces Harvey Barnes. Goal! Preston North End 1, West Bromwich Albion 1. Andrew Hughes (Preston North End) from a free kick with a left footed shot to the bottom left corner. Ben Pearson (Preston North End) wins a free kick in the attacking half. Attempt blocked. Harvey Barnes (West Bromwich Albion) right footed shot from outside the box is blocked. Assisted by Kieran Gibbs.